The SS-2.0 Super Squirt Button Lock folder is certain to become one of our best selling knife kits of all time! If any knife kit ever had it all, this one is it... and it has it in abundance! Designed to compete with $250+ dollar knives on today's knife market, this hot little knife is cool looking, all stainless steel and ultra precise. 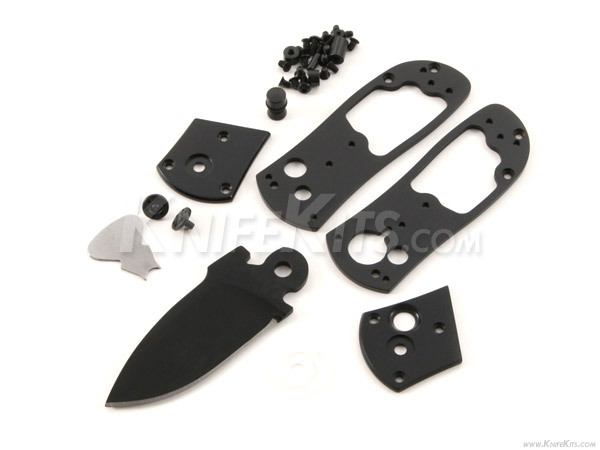 Designed by Darrel Ralph to be the finest quality kit available, with the added functionality of the button lock system, you'll have to look hard to find a better knife for the money and more fun to build, modify, pimp-out or operate. This is the culmination of over 10 years of kit design. This knife can be finished with simple assembly or modified with additional sanding, backspine and handle treatment upgrades. The sky is the limit! This Super Squirt kit model is our Tactical presentation and offers our new TiNi black coating finsh. All parts are coated with our special titanium nitride finish to complete the look and style of this "Black Project" design. A TiNi black coated clip is available as an upgrade.